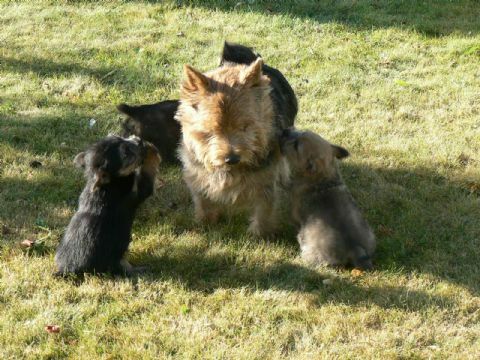 Located in the Canterbury Plains countryside, Norwester is a hobby show and breeding kennel dedicated to the improvement of the Norwich Terrier breed in New Zealand. Careful attention is paid to health and temperament as well as correct conformation and movement. Foundation stock was from the Blair-Na-Park and Chesney kennels, with recent importations of English blood from Karrell, Queensland, (Jann and Ron Trout) and Rouletta, Yorkshire, England (Maureen Chambers). Pictured here is NZ CH Rouletta Havin a Good Thyme (Imp UK), 1CC, 5 RCC, with some of his children. While show success is a measure of sound breeding, my hope for all Norwester puppies is that they will be loved companions. It is a pleasure to keep in touch with Norwester puppy owners in Australia and New Zealand. Enquiries about puppies are always welcome.